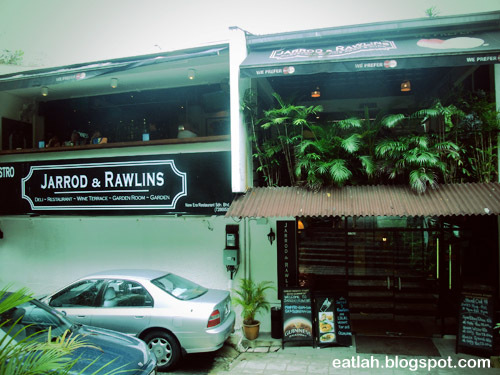 Jarrod & Rawlins @ Damansara Heights, KL | where and what to eat lah? It was a gloomy cloudy Sunday morning, we had sudden cravings for English breakfast over a beautiful open air garden filled with luscious green scenery. Jarrod & Rawlins (the brainchild of Malaysians Jarrod Chek and Denis Rawlins) was the perfect place for this occasion. 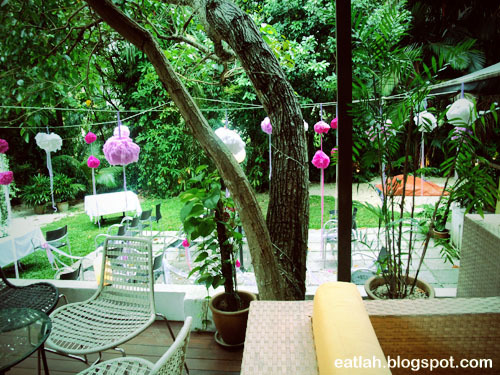 Situated in a converted bungalow located in the leafy and breezy surroundings of Lorong Dungun in Damansara Heights. With a private fine dining room, a bar upstairs with overlooking balcony and a outdoor beautiful garden surrounded by trees, Jarrod & Rawlins can accommodate many different events and parties. As much as we wanted for a garden breakfast outside while soaking up the morning sun, it was occupied for a wedding event. 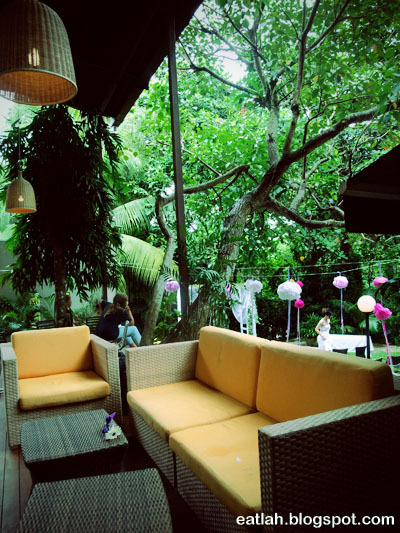 Instead, we chose the airy balcony bar upstairs overlooking the bungalow's entrance. 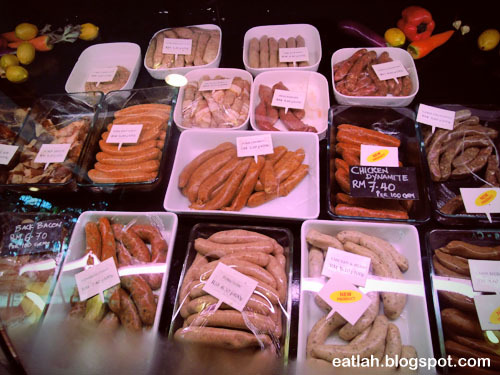 Jarrod & Rawlins is renowned for their choices of fresh deli gourmet sausages, bacons and pork meats. You can either order ala-carte dishes from the menu itself or go frenzy customizing according to your preference via the counter. 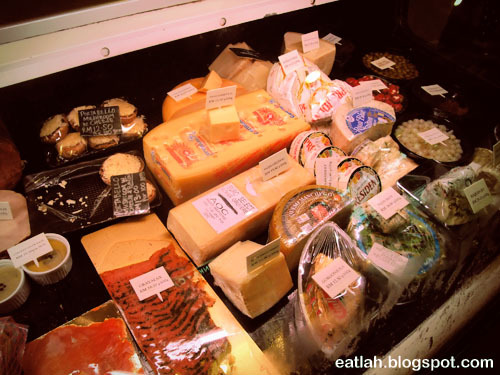 Besides that, you'll have different choices of imported cheese, smoked salmon and huge portabello mushroom. 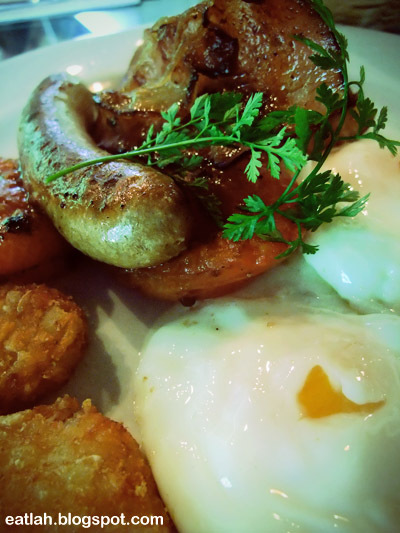 After a long wait, our first dish finally arrived, the J&R Fried Breakfast (RM 28), with two organic eggs sunny side up, sausage, bacons, grilled tomato, hash browns, toast bread served with coffee and orange juice. It was a very hearty tasty breakfast. RM 28 was the price paid for being lazy to prepare breakfast at home and for the added bonus of being surrounded by green trees and foliage, giving you a very 'green' nature feel to the meal - priceless! 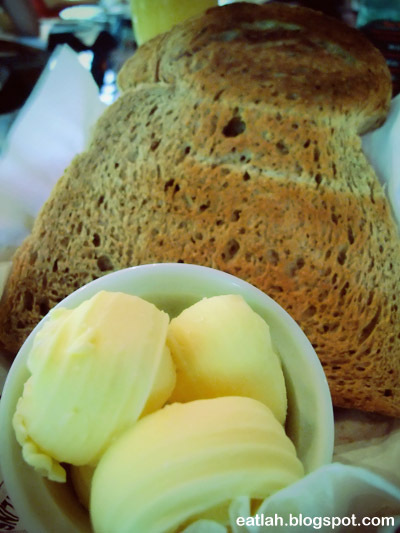 With two slices of large toast and beautiful butter curls. 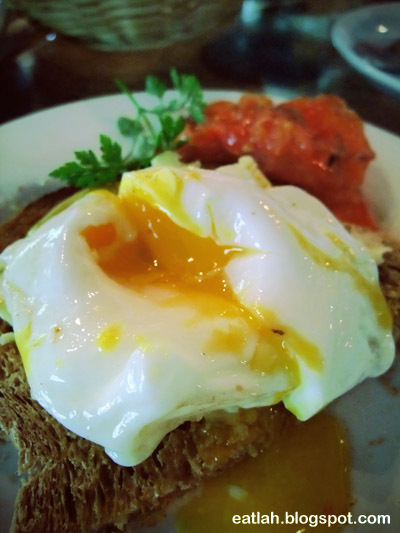 Our butter soaked toast with a perfect poked runny egg yolk surrounded by firm egg white, it was a real pleasure mopping the runny mess with the toast! I wanted something different, gotten greedy and ordered my most expensive "breakfast" platter ever. 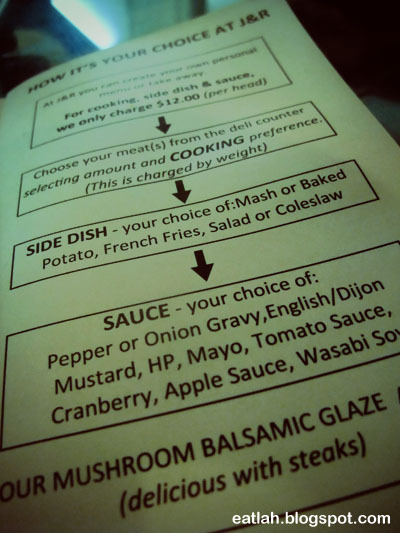 It cost RM 12 per head for cooking, choose a side dish (mash or baked potatoes, fries, salad or coleslaw) and sauce. Then, be prepared to wait for at least 20 minutes for them to cook. 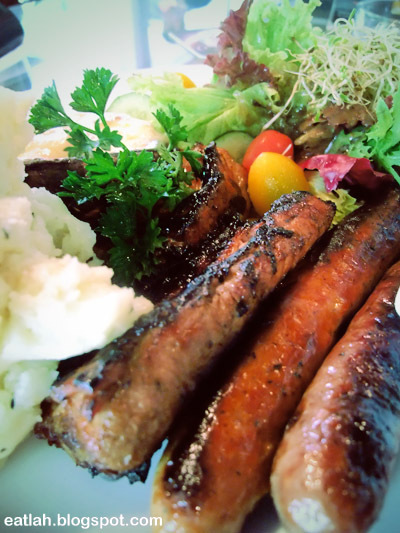 It was a meat-mania, I picked one dynamite chili sausage (RM 6.36 / RM 7.40 per 100gm), one lamb and cranberry sausage (RM 4.47 / RM 8.60 per 100gm), one grilled pork spare rib (RM 15.42), one portabello mushroom with baked cheese and bacon bits (RM 13.78 / RM 13 per 100gm), one serving of green salad (RM 8, stupid me for not reading the fine prints, "choose a side dish"), and a huge serving of mashed potatoes. It was a crazy breakfast and the damage in total cost RM 60. The dynamite chili pork sausage was indeed spicy and flavorful. The lamb and cranberry sausage without the overpowering 'lamb' taste and a hint of sweet cranberry in it, but I was expecting for a stronger juicy 'lamb' and cranberry tastes in it. Mushroom was goooodd, piping hot cheese all melted into the glorious mushroom with bacon bits in it, expensive since it shrank in size after cooking. The mashed potatoes was rich and smooth. The best of all, the grilled pork spare rib, it was mind blowing tender, juicy with smoky sweet caramelized flavor. 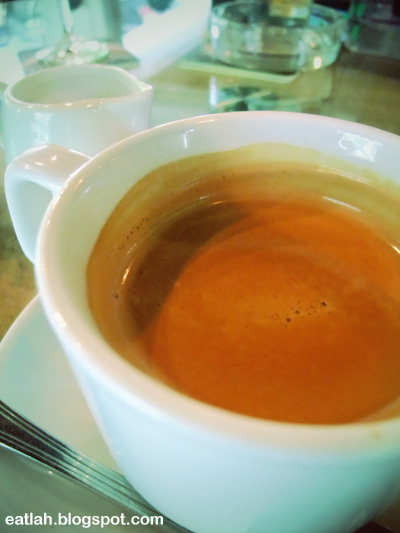 No better way to end a perfect meal and kicked start a gloomy Sunday with a cup of warm aromatic strong coffee. I was absolutely stuffed and having a good breakfast like this lasted me till dinner for that entire day! Verdict: Costly but a worthwhile experience once awhile for poor slaves like me. In return, you'll get to enjoy a 'slow' relaxing comfortable dining experience. I went there last week, the food was good, but I waited 45 minutes and my family and I were served last when we were earlier than most there. :( Perhaps the waiter forgot our order. Got a 10% discount but am wondering if everyone had that discount too. Good day! I just would like to give an enormous thumbs up for the great data you will have here on this post. will likely be coming back to your blog for more soon. Hi there! I just want to give a huge thumbs up for the nice information you’ve here on this post.